Despite the faster internet connection that is available for most of us, our surfing experience on some websites are still slow. 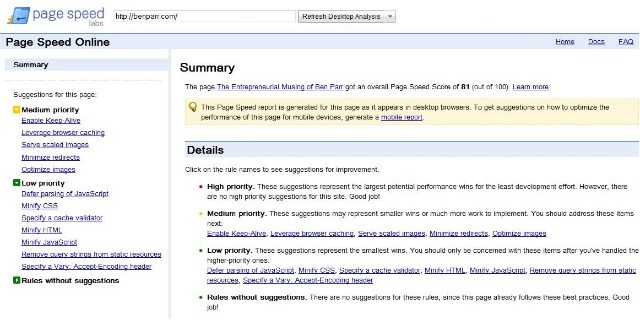 Google recently released a tool that will suggest you ways to make your website faster for the users, Page Speed Online, aim to analyze the websites to see how the webmaster can improve the speed. Page Speed Online is a simple tool for everyone to use, simply type in the address of the website on the tool, and Google will come back to you with different suggestions. Each website will have an overall score out of a 100; the suggestions will be rank in the High, Medium, or Low category. Some of the suggestions includes combine images into CSS sprites and minimize redirects, leverage browser caching, remove query strings from static resources, and minify Java Script. These suggestions as mentioned earlier are categorized in a high, medium, or low priority, therefore, it is entirely up to you whether you want to adopt the suggestion. Page Speed Online also analyze mobile websites and its speed, therefore, it gives a different set of suggestions to the mobile websites and not the same one as the desktop websites which I think is very useful. Which online speed analyzing tool are you using? Do you Page Speed Online is useful for your website? Let us know your thoughts.